Abfraction lesions are characterized by a “notching” appearance on the tooth roots, at the gum line. 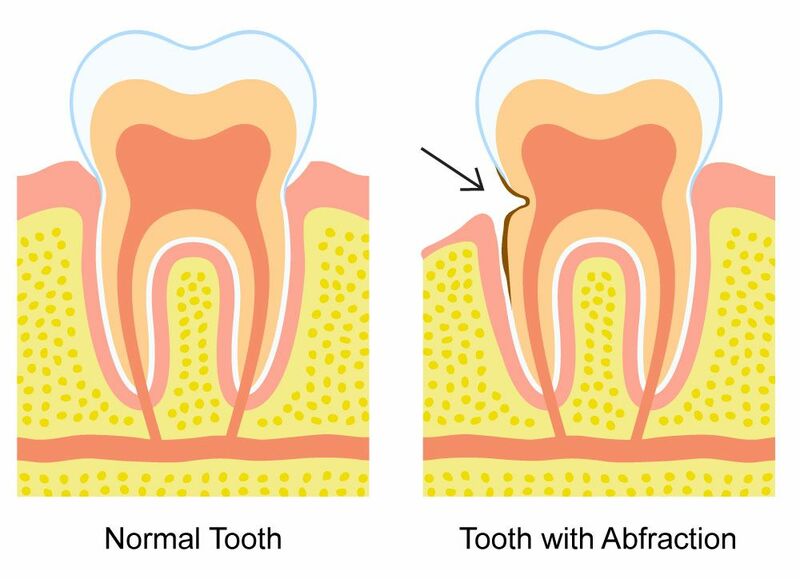 While tooth abfractions can resemble a cavity, this type of damage is not caused by decay. Because the tooth roots do not have a protective layer of enamel, they are much softer than the crowns of the teeth, which have mineral-rich enamel. For this reason, the roots of the teeth are susceptible to abfraction lesions. In Red Bank, NJ, Dr. Michael Bixby offers restorative dentistry treatments to repair dental damage and tooth abfractions, and help prevent further problems. Brushing Habits: Excessive brushing or brushing too hard can result in notching. Switching to a softer toothbrush or adjusting your brushing technique can help reduce the chance of tooth abfractions. Diet: Foods and beverages high in acidity can eat away at the enamel on teeth, making you more prone to this type of damage. Occlusal Stress: If you have misaligned teeth, or a bite that does not fit together properly, it can increase the risk of abfractions. Bruxism: Grinding or clenching places excessive force on your teeth. This constant stress can result in damage to the enamel, making abfractions more likely. What Do We Know about Abfraction Lesions? Although certain aspects of tooth abfractions remain a mystery, researchers have made some notable discoveries. These types of lesions seem to be more prevalent in females. It also seems that the risk for abfractions increases with age. Perhaps most notably, scientists have reason to believe tooth abfractions are a contemporary problem, as they have not found signs of it in pre-modern populations. Because the causes for abfraction are different for each patient, treatment options can vary. After diagnosing the source of damage, Dr. Bixby will help you determine a treatment option that will best meet your needs. Tooth Fillings: Abfraction lesions can be repaired with a small tooth-colored filling. Resin composite material is used to fill the notched area, and the root surface is smoothed and shaped to blend in with your smile. Dental Crowns: In cases where the lesion is too large to be properly treated with a filling, a dental crown may be used to strengthen the tooth structure. Bite Guards: If clenching and grinding seem to be the cause, a custom mouth guard can be made to protect your teeth from further damage. If you notice signs of dental damage or tooth abfractions, schedule an appointment with Dr. Bixby. By assessing your situation, he can determine what options are right for you. Contact us online anytime, or call our office at (732) 224-1160.